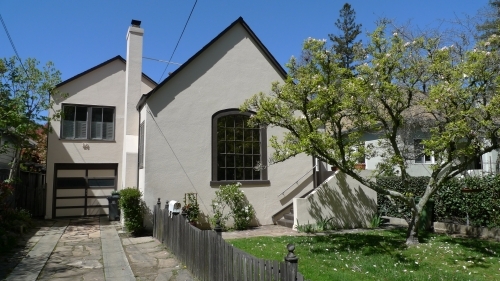 I just had the pleasure of helping my long-time clients purchase a cute home in the flats of San Anselmo. We had to move quickly and decisively to secure this property because the Marin real estate market has turned very competitive for certain price points. We were able to overcome a multiple offer situation and negotiated a good deal for everybody. Located on a picture-perfect, tree-lined street, this charming three bedroom/two bathroom home features hardwood floors, a bright breakfast room, bonus room, as well as lovely molding and detail found in many 1920's San Francisco homes. With a flat yard that boasts mature magnolia and fruit trees, a deck off the kitchen which transitions to a patio in the backyard and an outdoor fireplace/grill, it's perfect for entertaining. The house also has a formal dining room, living room complete with a wood-burning fireplace, a large unique vintage window, and a large unfinished attic. And it's within walking distance of downtown San Anselmo in addition to downtown Fairfax. Find out how I can provide a highly effective solution to sell your San Anselmo home with the best possible terms in today's market, by combining Internet expertise, access to our database of thousands of buyers, key relationships and other tools. For a complimentary consultation regarding your home's value and market analysis, contact Jonathan B. Jacobs to schedule an appointment.